Dr Christiane Northrup is one of the world's most trusted medical advisers. In The Wisdom of Menopause, the bestselling author of Women's Bodies, Women's Wisdom and Mother-Daughter Wisdom gives you all the medical and nutritional advice you need about the menopause. 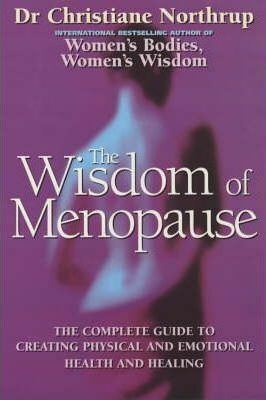 In particular, Dr Northrup examines the connection between the menopause and a woman's emotional and spiritual development during this important period of her life. Combining expert medical information and advice with mind-body healing, Dr Northrup explains: How to deal with the physical and emotional symptoms of the menopause; How to decide about HRT and alternative supplements; How to prevent long-term problems such as heart disease, hormone-related cancers, and memory loss; How the menopause can become a period of considerable personal empowerment. Christiane Northrup MD is the bestselling author of Women's Bodies, Women's Wisdom has so far been read by a staggering 1,250,000 women. She is an internationally recognised authority on women's health and healing. Dr Northrup is a holistic physician, Assistant Clinical Professor of Obstetrics and Gynaecology at the University of Vermont College of Medicine and member of the Natural Healing Health Advisory Board in the United States. Along with three other practitioners, Christiane founded and runs the Women to Women clinic in Yarmouth, Maine, addressing the specific health concerns of women.